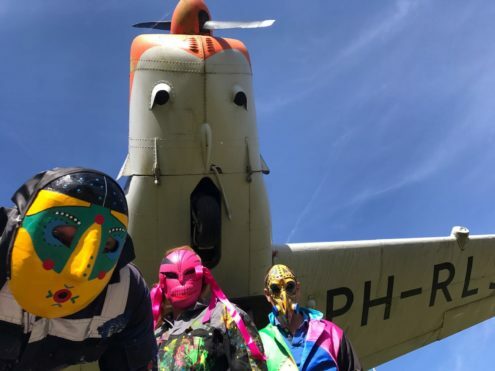 Just like the Cobra movement formed at the end of the 1940s, the toyism art movement seeks to plug into the experiences of children, while indirectly also appealing to all adults. Toyism is a contemporary art movement that originated in the 1990s in Emmen, The Netherlands. The word symbolises the playful character of the artworks and the philosophy behind it. The suffix ‘ism’ refers to motion or movements that exist in both the world of art and religion. Nevertheless, the game of toyism is a serious matter that shows a new, critical and sensitive perspective on our present-day world. Toyism as art movement is a reaction on the post-modern world of individualism, which existed in the 1970s through the 1990s, the era in which “everything is allowed”. On September the 5th 1992 artist Dejo (pseudonym) writes a manifest called Mother and introduces toyism to the audience. The highly egocentric character that is deeply rooted in the arts becomes the basis for another ideology; the individual would play second fiddle to the group without sacrificing on the personal level or in quality. The current toyism is a mixed group of professional artists from around the world with diverse cultural backgrounds and working in various disciplines, who can influence and enrich the style and, importantly, who put the art in the forefront and not themselves. A new type of artist surfaced during the nineties of the past century. Artists were expected not only to exploit artistic talents but also to act as entrepreneurs. Toyism was introduced by the artist Dejo, originally from the Netherlands. He quickly grasped that the best guarantee for successful artistry consisted of a combination of those two elements. In the past, an artist primarily achieved results with materials science, artisanal skills, knowledge of art history, an original style, approach, and visual language. Today, the success factor is also determined by competencies that are difficult to measure, such as organisational talent, commercial insight, inventing effective business structures, the ability to assess the value of one’s own attitude and to achieve a good return on that attitude, and to have the courage to continually begin new projects without knowing their outcome. Artists are confronted with coincidences and uncertainties on a daily basis. They do not need analytical models, market research or statistics in order to function properly. Nevertheless, they must in fact acquire the mentality of an entrepreneur. This seems to be an impossible balancing act. Yet, with toyism, the toyists prove that it is possible. A manifest is an excellent tool for ensuring that everyone is focused on the same direction. It eliminates the need for difficult discussions and pernicious differences of opinion. Nonetheless, toyism encompasses without a doubt the cultural background and contribution of each individual artist. This causes the style to steadily evolve and grow. Today the movement consists of 20 artists. Their pseudonyms begin with a letter they selected from the alphabet. None of the pseudonyms can share the same letter, unless a toyist has left the group and the letter has become available. This limits the number of toyists to 26. The once-only use of the 26 letters is also a nod to the number 13 (26 = 2 x 13), which possesses a specific significance within the movement. The toyists, consisting of men as well as women, originate from all over the world: USA, Canada, South Africa, Malaysia, Australia, Romania, Iceland, and the Netherlands. Uppspretta is the name of a toyist artwork situated in the Icelandic town of Keflavík. In 2013 a neglected water tower, being nine meters in height and thirty-six meters in circumference, was transformed into an object of art. The painting shows the story of a puffin named Uppspretta. On July 14, 2009 the group is ventured upon an extensive project: painting a spherical gas storage container, being 22 meters in height and 1250 square meters in surface, situated in Emmen, Netherlands. The toyists transform this object within 9 months (6000 hours) into a colourful artwork called The Dot (De Stip in Dutch). The Dot tells the story about Living with Energy. In april 2012 the toyists started with the painting of the outside of Hotel Ten Cate in Emmen. During five weeks the hotel was hiding behind a huge scaffolding with canvases. Thirteen toyists have expressed their creativity from early in the morning until late at night on the 600 m2 facade of the building. The intentional choice for anonymity, de-individualisation, preferring a guerilla approach, having a predilection for staging at public spaces and an anti-establishment mentality, includes the ideas of the toyists. A mixed group of professional artists from around the world with different cultural backgrounds working in various disciplines that affect toyism, add value and important, placing the art in the foreground and not themselves. “The movement effectively bridges the gap between high and low culture and seeks new ways to communicate with the public. This leads to an exciting search for the way in which the discussion about the social playing field by visual arts can be lifted to a higher level without losing sight of the clarity and purity of the intentions. Public participation is enforced in a playful way and generates joy in which all parties feel involved.